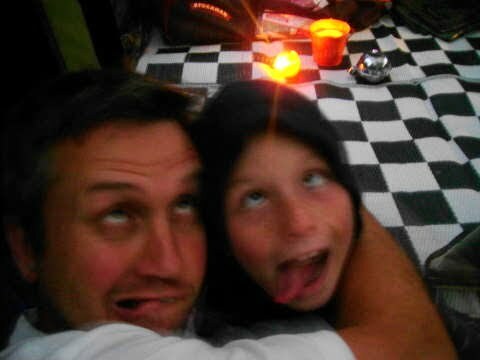 As I write this Dash and Daddy are bonding - camping in the backyard. 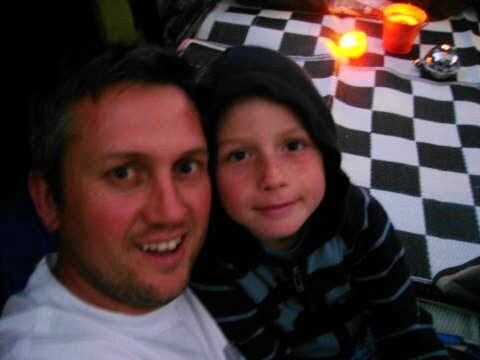 It's a bit of a tradition which began when Dash was four; they pitch the little dome tent in our backyard, stuff it full of sleeping bags, pillows, torches and board games and then settle in for a "boys night". That first time I brought them out cookies and milo; this time we are all out of milo and cookies. So they're roughing it, sort of. Actually they're in the Big Family Tent this time. Next week we're off camping (for real, all of us) so Daddy decided the tent needed airing out. We also probably need the practise putting it up - you know - to (hopefully) avoid those public camping ground "marital discussions" you tend to have while attempting to pitch a tent and look after umpteen kids at the same time???!! (Yep, we're taking a few extras with us). Anyhoo, I digress. 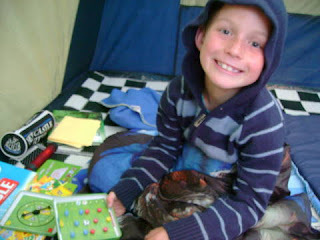 We pitched the tent (had a few minor marital discussions); we played some family games in it (charades, Trouble), had a BBQ and after the youngest two were tucked up in bed, out went The Lads for a bit of bonding and board games. Ahhhhh, and now for me a night of peace watching girly movies. Bliss. Go boys, have fun camping! P.S. 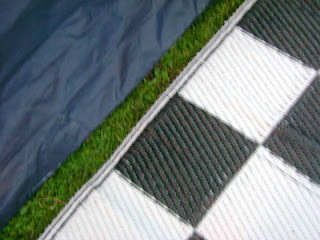 If you're wondering why our tent floor looks so fab, it's a camping trick I copied off a friend: woven plastic Chinese (or Polynesian) mats, approx 2 metres square; they only cost $18 each from a Chinese trader, feel lovely and soft to walk on (plus adding warmth) and best of all, the sand filters right through them - so no gritty sandy tent floors. Oh yes, we are in luxury now, boys! Oooooo - what a cool idea about having the mats for the floor!! My boys also had a guys only tenting night last week! Such a great idea. Oh yeah...I do love the floor!!! so cool...you are so clever! this is what ia get for posting a comment to 3:27am...it should say...do your tents come without floors.....time to go back to bed! Now your back yard looks pretty good for setting up camp... mine, well its is sloapy and full of big ants so don't think we will go there, however i think the idea of camping like dinners is a great idea. Thanks. OH BTW I loved getting to meet you again too. 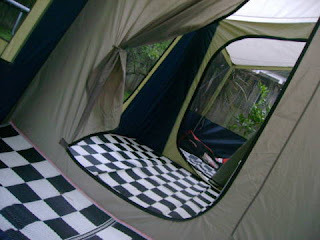 Wow-nice tent! Love the chinese mat idea. Tom and Abby backyard camped last fall and she was in Heaven. We have yet to go real camping. Have a great time next week! Quite loving that floor! While we were away I was thinking that we need some island mats to make it perfect! Our tent DOES come with a built in floor, but the third "room" is just a removable "awning", so I put down some tarps and then the mat to give us another fully usable room. The kids will go in the back room, us in the middle one and the foody stuff in the front. We will be soooo better set up this year! Last year was ICKY! 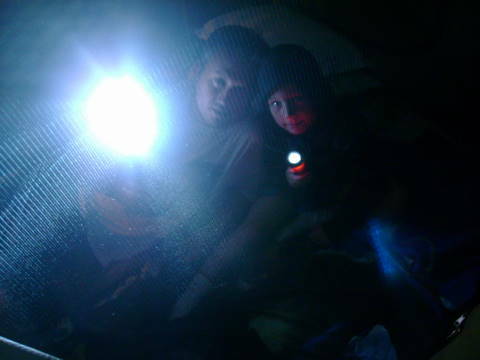 We do the same thing at our place - the tent goes up for some impromptu kid camping fun. We've had ours up since Sunday! 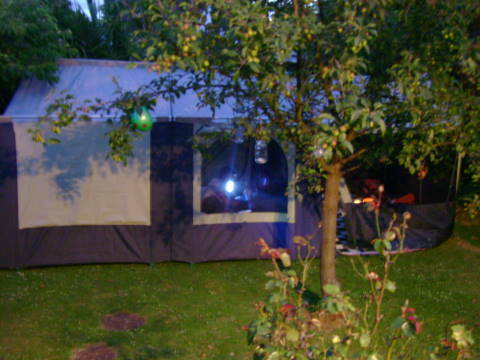 It'll probably go down tonight though, cos' the kids are slightly over the sleeping outside in the dark thing! What a great idea! Neat brother bonding.